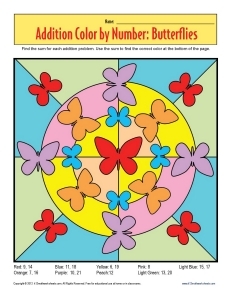 There are lots of butterflies on this color by number worksheet. There are also lots of addition problems! Your youngster must solve the problem to find the correct color for each space in the picture. While it's fun to do, it's also a good way to practice basic addition.